Randomized controlled trials (RCTs) are the gold standard of medical research and have evolved significantly throughout the past three centuries. Conducting an RCT requires a thorough understanding of the process and its nuances. 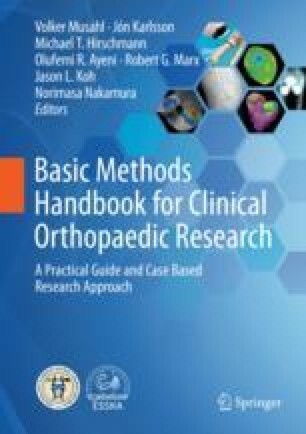 More specifically, the use of RCTs in orthopaedic surgery poses unique challenges, which must be understood and navigated appropriately. The terms “prospective”, “randomized”, “blinded”, and “controlled” each have specific meanings which are important to understand. Planning an RCT requires a clearly defined question, survey and/or pilot studies, sample size calculation, and the organization of support infrastructure. Each phase of the RCT itself has different goals and requirements, as the project moves from ethics approval to patient recruitment and allocation, intervention, follow-up, and data analysis. Finally, it is important to ensure that the key findings of an RCT are disseminated with an appropriate level of detail to respective groups of stakeholders. Traditionally, this includes publication of one or more manuscripts in a scientific journal, but can and should include some public forms of communication, including but not limited to press releases, media outlets, and social media. This chapter summarizes the process of conducting an RCT in orthopaedic surgery by using a completed RCT as a case study. Higgins J, Green S. Cochrane handbook for systematic reviews of interventions version 5.1.0 [updated March 2011]. Cochrane Collab. 2011;0(March):10–11. http://www.cochrane.org/training/cochrane-handbook.